This is Isochron presenting Meta Monday. As always, if you want your name in the article, make sure to submit your games to our form (which you can find by clicking here). If you have a large data set (over 50 games), you can DM it to /u/IsochronEternal on Reddit or to [TRS] Isochron#0801 on discord. Last week we had a record setting low data set of only 212 games, this week, it more than tripled in size, and our sample size is 674 games. This is the most games the community has ever submitted to the breakdown. I also started playing for fun again this week, and the reasons for why that happened will be touched upon once we get to the actual breakdown. 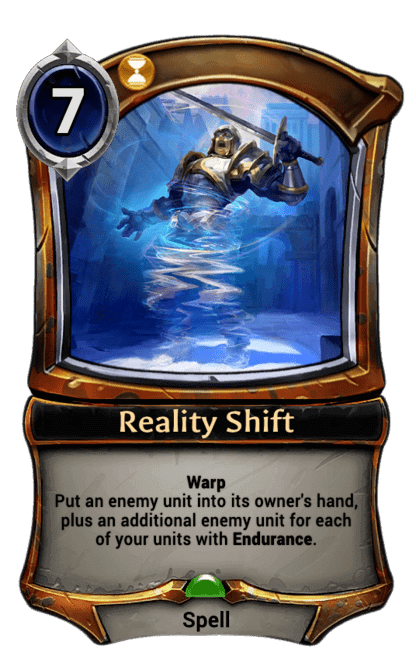 To say that Eternal experienced a drastic meta shift would be a colossal understatement. This week we got hit with the pains of having a new metagame at full force. There are many places where I made judgement calls, had to combine archetypes, and so on. So I would ask everyone who submits decks to pay extra attention and make sure to note specific details if the opponent plays a deck that has the same factions as any other deck in the metagame. Tier 1 – Very popular, a sizable minority of your ladder games will be against tier 1 lists. Tier 1.5 – Meta defining lists that are not quite dominant enough to be tier 1. Tier 2 – Popular decks that you should keep in mind. Tier 3 – Obscure decks that you’re unlikely to run across. Tier 4 – Very rare decks, only one person could be playing them. There are two elephants in this room, and I’m going to tackle FJS and Jennev Peaks first just because I can’t contain myself. For those of you who know, despite Meta Monday being a fairly objective series, I personally highly disliked the previous metagame. I could not stand that FJS and Jennev Peaks which had many similarities in playstyle were dominating the metagame on a massive level. And with the development of the Homecoming meta, both of these decks have been pushed to being fairly unpopular. FJS has even fallen into tier 3 when it was previously dominant for three months in a row. Jennev Peaks is on the very borderline of being considered a tier 3 deck. This is a very welcome change, and it feels like I can finally play the game without having to play the same matches over and over again. With that positive note out of the way, let’s tackle the new king, Ixtun Sites. And the truth of the matter is, that Ixtun Sites is theoretically a tier 0 candidate. But it fails to meet the criteria of being consistently dominant, which I think is integral to judging a deck to be tier 0. The meta is unstable enough, that Ixtun Sites could only be 7% of the meta next week. The second reason why I’m not ready to declare that this deck is oppressive is that it’s really three decks in a trench coat. It has distinct tuning choices to be midrange, control, or tempo-ramp strategies. There are so many ways to tune Ixtun Sites that they all blend together into one specific core strategy. It’s very hard to objectively distinguish these decks, so even though they play differently, I’ve had to include them into one category to not cause statistical fuzz due to people not seeing enough cards to distinguish which particular build they are facing. Ixtun Sites is a very experimental archetype, and we can expect it to change more in the future. Currently, the optimal tuning of the midrange and control strategies are becoming closer to each other, but next week we may see it break apart into four different archetypes from innovative players building great deck lists. The rest of tier 1 is just Rakano Aggro at 7.7% representation. Rakano Aggro has been the go to aggro deck for the entirety of Defiance, so seeing it remain popular isn’t much of a shock. It’s a good deck for all kinds of players, so even though it’s not a powerful deck, we can expect it to stick around. But here I have to break convention and create a “Tier 1.5” for the first time in Meta Monday history. This metagame has too many choices for powerful decks that it doesn’t feel right to split them between tier 1 and tier 2. So, in our newly created tier 1.5, we have Hooru Midrange, Xenan Midrange, Auralian Pledge, and TJP Pledge. These have been the stand-out non-Ixtun decks from Homecoming. Hooru Midrange was already picking up pace before Homecoming, and getting the Korovyat Palace has just made it skyrocket in viability. Although more pressures from Ixtun decks and the other tier 1.5 decks has made it less popular than it was last week. Xenan Midrange is another one of the defining decks, as both Ponysnatcher and Desecrate have managed to create a truly monstrous midrange deck. This is the first time that time midrange decks have had the tools necessary to play like genuine midrange from some other games. Time decks have historically just used big units to get so much board advantage that the opponent can’t do anything. But the current Xenan build combines pressure, removal, and threats in such an expert way that it has managed to compete as a serious midrange deck. Both Auralian and TJP Pledge decks work by using Glasshopper to their advantage, a card which I thoroughly underrated. But in my defense, the additions of Bear Guard Bayonet, Severin, the Mad Mage and Silverwing Courier are foundational for both of these decks. So even though I did not think that Glasshopper would be that great, getting more pledge options has made consistently pledging into something that’s attainable and incredibly beneficial. These two decks are still extremely different strategies and have a lot of room to grow and evolve, I can’t wait to see how they end up faring in the long term and whether Direwolf Digital has managed to create a consistently powerful archetype by just releasing enough synergistic cards. But TJP Midrange also shares the TJP Pledge spot in tier 1.5. TJP Midrange is just a deck that takes the old TJP Midrange build from set 3, and brings it over to the current metagame with the new cards that are now available. The problem is that with the data I got, it was extremely difficult to distinguish whether or not the decks that people described as midrange TJP decks were the classic variant or the pledge variant. So, for anyone submitting data next week, please make sure the clarify whether or not the TJP midrange decks are Traditional TJP or TJP Pledge, because this is a judgement call that’s near-impossible for me to make in the current meta without sufficient data. In tier 2, we have the residual old guard of Skycrag Aggro, Jennev Peaks, and Combrei Ramp. These are still powerful decks, but have currently been displaced by the popularity of the Homecoming strategies. Tier 3 also has some old decks in the form of FJS and Maul. Praxis Midrange was also popular this week, mostly due to the experimental Praxis Glasshopper builds, but the more interesting decks are at the very bottom of tier 3. Mono Shadow is a completely new archetype, and I personally hope that it gains more traction. It’s unique and interesting, and manages to be completely unapologetic in its single mindedness. Seeing decks without a second or third faction succeed is very refreshing in the current landscape where three faction decks are the norm. The simplicity of just having one faction is beautifully elegant due to the sheer scarcity of these sorts of decks. Tier 3 also has Feln Control, an old favorite that has gotten rejuvenated by Desecrate. It always lacked a good early removal option, with both Rindra’s Choice and Annihilate being gambles on whether or not the opponent plays a mono or multi faction unit. Permafrost is far too impermanent, and Suffocate can only remove early game threats. 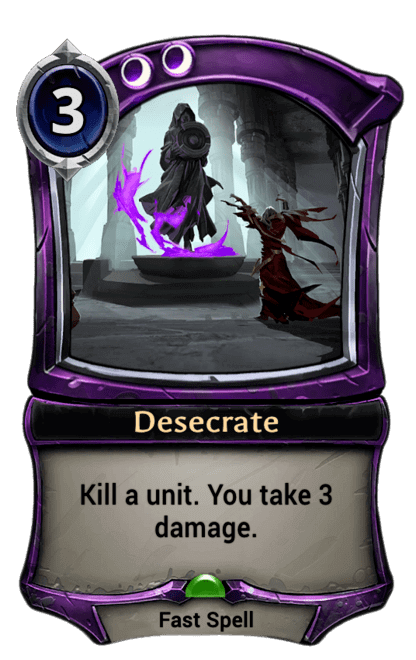 Desecrate gave Feln the piece of removal they desperately needed, so it’s fairly clear why the deck has begun picking up steam again. Tier 4 also has a lot of cool decks, mainly TJP Alessi. TJP Alessi is a completely new archetype, using a lot of old pieces. It’s definitely experimental, and probably will not end up as the most powerful deck in the game, but combining pieces from Hooru Midrange and TJP Blitz has resulted in a fantastically unique deck. JPS Control is my personal favorite, so seeing it show up on the map is always nice. JPS also experienced the Desecrate effect, but it’s a lot worse at casting it than Feln Control. I would love to see JPS become a popular deck, but I don’t think all the pieces are quite there. Auralian Relics shares a few surface level similarities with Auralian Pledge, but relies on Rat Cage and Xenan Obelisk to close out games instead of trying to go for a more generic midrange strategy. And Mono Justice has made the shift from an aggressive deck to a midrange deck, while still remaining a fairly cool fringe option. The meta is changing and evolving, and that’s a very good thing. Most of Defiance was fairly stale, so seeing a shake-up of this magnitude is long overdue. And knowing that Xo will get nerfed sometime today is just another bonus, as both FJS and Jennev Peaks will lose one more piece of the ground they stood on while also conclusively preventing Ixtun Sites from transforming into just another three faction Xo greedpile.